The 92nd Infantry Division was a unit of the United States Army in World War I and World War II. Organized in October 1917 at Camp Funston, Kansas, the unit was formed with African American soldiers from all states. 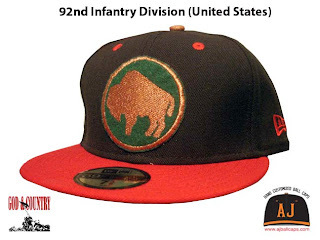 Before leaving for France in 1918, the buffalo was selected as the divisional insignia due to the Buffalo Soldiers nickname, given to African American cavalrymen by Native Americans in the 19th century. The "Buffalo Soldiers Division" nickname was inherited from the 367th Infantry, one of the first units of the division organized. This segregated unit was the only African American infantry division to see combat in Europe during WWII, as part of the 5th Army. It served in the Italian Campaign from 1944 to the war's end.